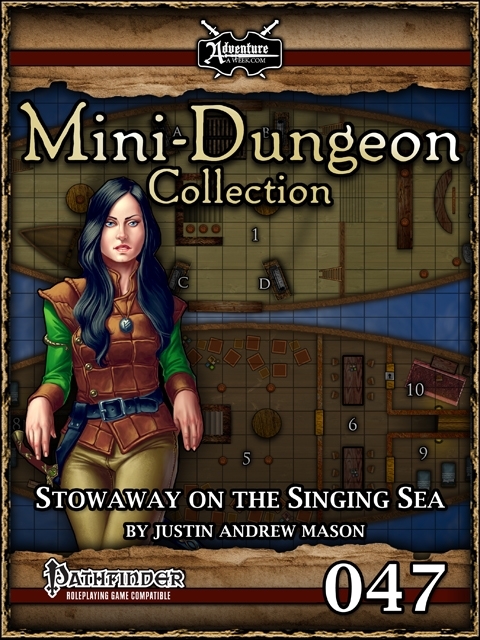 I'm excited to announce that my adventure "Stowaway on the Singing Sea" (published by AAW Games / Adventureaweek.com) landed a 5-star review from Endzeitgeist! Yet another really great review! 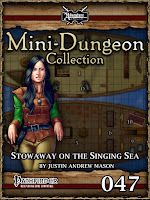 "Stowaway on the Singing Sea" is a Mini-Dungeon adventure designed for 5-8 character of levels 3-4. The adventurers have been hired by local authorities to sneak aboard the merchant ship, The Last Song. The vessel is owned by the Elloise Drake (suspected of also being the nefarious pirate, Lady Wavedancer). Law enforcement at the port city of Tangran’s Landing have managed to arrange for a “special piece of cargo” to be loaded upon the vessel for its upcoming voyage. Rather than the fine silks said to be in the shipment, the adventurers are smuggled aboard hidden inside.